I had one of those nights where I had one too many gimlets, and the next morning I woke up in this groggy haze, where I was convinced that only a proper plate of eggs would clear everything up. There are a lot of options for eggs in the city, but when you’re this hungover, only one type of egg will do – a fried egg, preferably two, served alongside some tender slabs of braised beef brisket and a side of crisp arugula. When you can barely think straight, you need something hearty with punchy flavors to snap your taste buds out of their drunken funk, which is why the brisket and eggs, with its savory medley of Middle Eastern spices and robust fillings, is so perfect for the morning after. Not only does it taste good, but the dish has some serious medicinal effects. You know how when you’re hungover, your stomach either feels queasy or you just feel a little uncoordinated in general? The brisket and eggs literally ground you, providing you with the warm center needed to regain your balance and go on with your day. 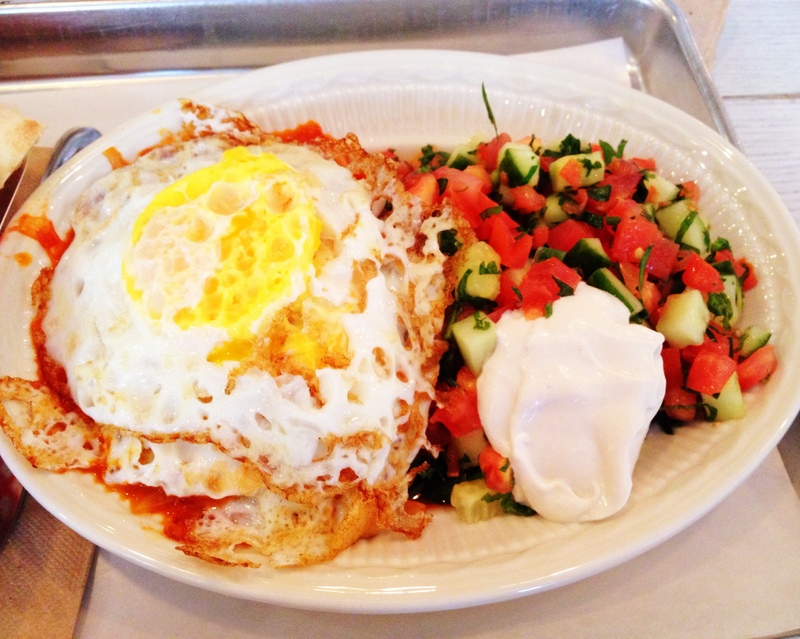 The shakshuka egg plate has similar therapeutic effects, perhaps even more so than the brisket. In this dish, the eggs are served alongside a thick, spicy tomato sauce, just begging for you to sop it all up with some pita bread. Running the bread through the sauce and having it absorb the warm, luxurious and fragrant flavors was really quite a dream, one that I didn’t want to wake up from. Sadly, when the pita bread ran out, it was back to reality. Taboonette is more of a take-out restaurant with a few communal tables, but really, when you’re that hungover, you don’t need to scare the world with your post-bender likeness. Quickly getting takeout or ordering delivery probably makes more sense. 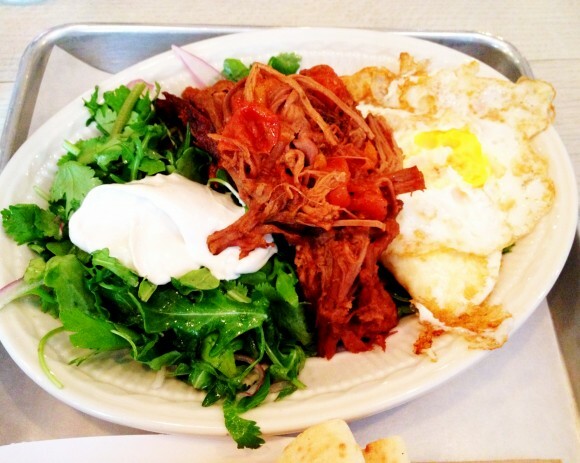 Either way, the heart wants what it wants, and it wants an egg plate from Taboonette. 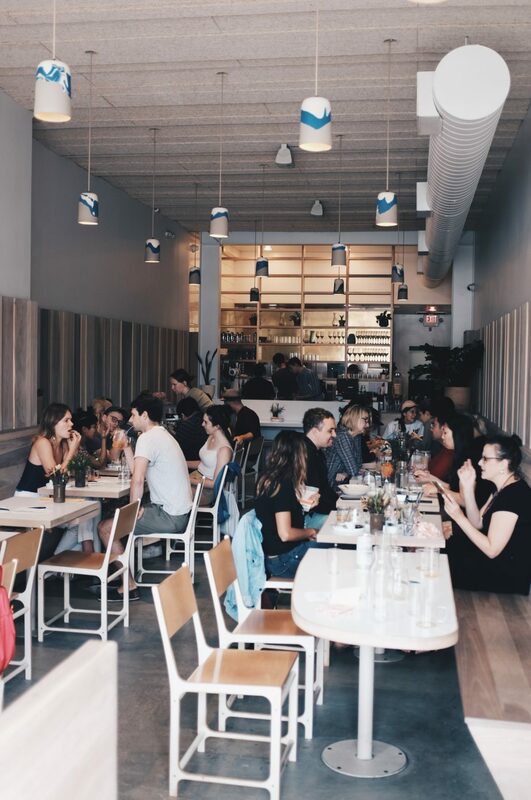 On the days when you are at your most beautiful and not hungover, brunch at Acme might be a little more appropriate. 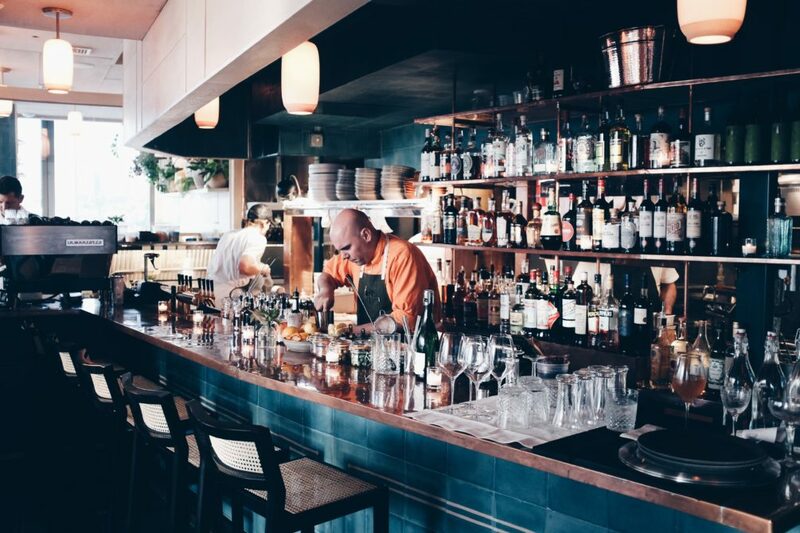 The restaurant, which is run by Chef Mads Refslund, co-founder of the world famous Noma, not surprisingly serves new American food with Nordic influences. 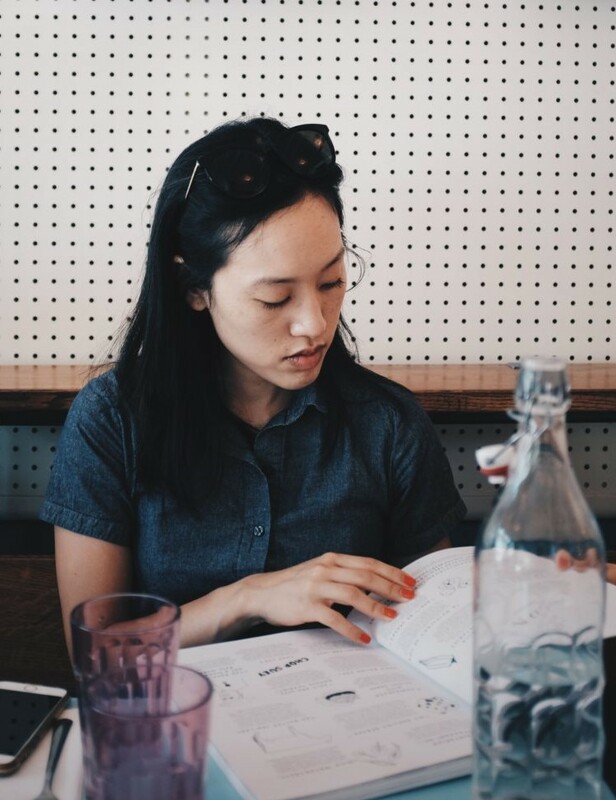 Since Scandinavia is involved, you know that the food and the clientele is going to be good-looking. Waifish hostesses, aloof models-slash-servers, Eastern European prosties–they are all part of the backdrop. For such a scene-y place, where everyone looks delicate and trim, the food is surprisingly heavy. 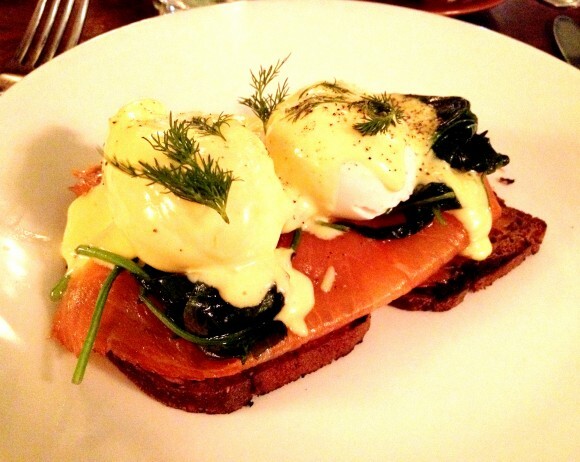 We ordered the smoked salmon benedict and the chicken and eggs, and we couldn’t really finish them all. The hollandaise sauce on an eggs benedict is usually pretty heavy, but this one felt extra rich, and after eating half I felt extremely weighed down. Perhaps if there were something distinctive about the sauce or the lox I would be inclined to eat more, but nothing really stood out. The chicken and eggs was advertised by our waitress as being very substantial, so we were prepared for something large and meaty. But even so, the dish took the concept “meat and potatoes” to the extreme. 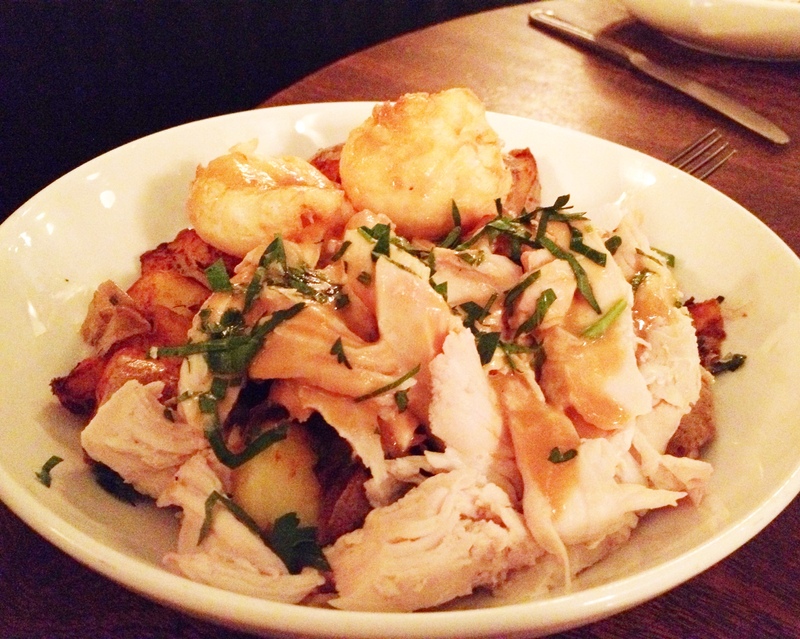 There were literally chunks of chicken and roasted potatoes piled high everywhere. Everything was well-seasoned–the chicken was tender and flavorful, and the potatoes had a nice char to them–but it was just very over-the-top and very heavy. Of course, it didn’t help that we ordered a side of duck fat fries, which were absolutely divine. These were probably some of the best fries I’ve ever had. I suppose cooking things in duck fat makes everything delicious. In fact, I’ve never met anything duck fat fried that I didn’t like. It’s clear that the standards at Acme are high and the cooking is well-executed, it’s just not the right place for brunch. It’s a little too early in the day to be eating such dense and heavy food. Maybe in the cold Scandinavian countries, this is how they do breakfast, but some things get lost in translation. 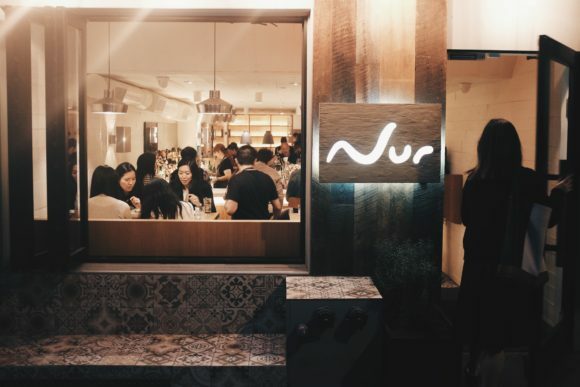 Come here for dinner instead, which does a better job of showcasing Chef Refslund’s skill in Nordic, foraging cuisine.